The proposed changes to service to my corner in Brooklyn will have a revolutionary effect on my life, essentially making public transport a viable option, where it is not right now. I am quite excited and hope these changes go through. You’d be surprised how touching this sort of comment can be to a network designer, even one who’s been in the transit trenches for 20 years. It really is all about humans. I spent much of 2011 leading a major study for Greater Wellington Regional Council, which developed a proposed new bus network for New Zealand's national capital. The resulting proposal re-allocates existing resources to create a much more extensive network of high-frequency all-day service, so as to expand the area in which transit can be used spontaneously for all of life's needs. This kind of extreme convenience is essential to reach a range of sustainability outcomes, notably by making it much easier for someone to chose to own fewer cars. A remarkable outcome of our proposal is that the percentage of the population within walking distance of frequent all-day service goes up from 58% to 75%. The last 25% live in very hard-to-reach or low-density places where it would be cost-prohibitive to run frequent service, so we are bringing high-frequency service to almost all parts of the city where it the densities and road network make it viable. That's important because frequency is freedom. High-frequency service (every 7-15 minutes or better) is service that's ready to go whenever you need to go, and that can even be used spontaneously to move around the city. This kind of network design work is a holistic exercise in multi-variable problem solving. Each idea for improvement has many knock-on effects that we have to evaluate, and it takes skill and experience to see the best network patterns that optmise across so many issues. The outcomes don't please everyone, and especially don't please people who are opposed to all kinds of change. But it is exactly the sort of network design that leads to stronger urban transit networks that more people find useful. This kind of design also supports more intense urban development where that's appropriate, thus providing more alternatives to horizontal expansion of the urban region. However, we're getting a lot of objections from the Green end of the spectrum. These have been summarised for me as follows. For the benefit of Wellington readers and also for anyone interested in the issue of Green responses to network plans, I'd like to reply briefly to each. These are my own views and do not represent the policy of Greater Wellington Regional Council or any other agency involved in the proposal. The concerns are in italic, with my responses below. 1. Some concern that technocrat/experts (even smart, nice people with great intentions) may not come up with a better solution than the whole community using the network–therefore it would be desirable to have more extended community input before implementing changes, or alternatively, to take staged approach to implementation to see if it works as intended. I'm a big advocate of crowdsourcing network design ideas, and often run workshops that invite local stakeholders to think together about a network design problem. That tool was not used in this study, but we did look for every possible source to inform the planning, and of course the government is consulting with the public now in anticipation that some changes will occur as a result. Note also that we relied extensively on data about how the system is currently being used, and this too is a form of public input. However, if you haven't been designing transit networks for a long time, there are some facts and techniques that won't be intuitively obvious to you. My book Human Transit is designed to address exactly this comprehension gap. It helps people who aren't transit planners to understand the transit network design problem, and thus to better evaluate transit proposals. And as I say many times in the book, the point is not to impose my values but to help communities express and implement theirs. 2. Concern that current journeys are influenced by the transfer fare penalty, and until we implement integrated ticketing, we won't really know the journey desire lines and therefore that really needs to happen before a network review. I have said consistently throughout the project that to fully succeed, the proposal will need integrated fares permitting free connections, at least within Go Wellington, the operator covering most of the city. I'm told that a separate study on fare policy, including connections, will be underway soon. Again, charging for connections is perverse, because connections are a necessary inconvenience, not a value-added feature. One strong reason to potentially postpone the Northern Suburbs area of the plan is that it requires free connections between different operators (two bus companies and a rail line) and this is much harder to achieve than free connections within the one operating company that covers the rest of Wellington. It makes sense to start in the main part of Wellington covered by one operator, where eliminating connection penalties is realistic in the short term. 3. Concern that the infrastructure for the trolley buses will be immediately removed on the routes that will be superseded, before we know if the new proposed routes will be successful and permanent. At no time during the project did anyone suggest to me that this be done. On the contrary, the thinking throughout the project was about ensuring that the trolleys had every possible opportunity to succeed. In fact, one proposed line, Line C, is mostly under trolley wire and designed to be easily converted to trolleys once there is a decision to expand the trolley network. I personally am a trolleybus advocate, as you can see here. However, our task in this study was to design the best possible network for the city, without presuming an outcome about a future debate about trolleybuses. That debate will occur in a separate study that the council is undertaking now. Planning is impossible without separability. Greens in particular tend to see how everything is deeply connected to everything else, so they are understandably suspicious about studying anything in isolation. Often they're right, and two issues really have to be studied together. Still, while everything is connected, governments simply can't do studies of every connected issue at once. In this study, we dealt with this question around the trolley bus issue and also around the fare policy issue. Wellington needs a study and public discussion about the future of the trolleys. Wellington also needs a review of fare policy addressing the connection issue. But if we did a plan that tried to deal with all those issues as well, it would be so huge and multi-messaged that few people could follow the whole thing, or see how the parts are related. The hard experience of planners and elected officials is that such overly grand proposals usually fall over from their sheer complexity of message and the diversity of controversies they raise. So the Regional Council took the view that we should study the city's mobility and access needs first, and get some clarity about what the network should ultimately look like. That's because they wanted their fare policy, and their trolley policy, to follow from the city's transport network rather than preceding and constraining it. If your goal is a city where people feel freer and more empowered to access the riches of their city at all times of day, that's the logical course. 4. That the network review will be used as an opportunity to force the wholesale removal of trolleys by those who are politically inclined to ditch them because of short term thinking. I can't control how the proposal is used, but this was not the intent, and I don't agree that the proposal advances a case for removing trolleybuses. Since the trolley fleet requirement goes down in the context of the whole fleet requirement going down, we clearly weren't discriminating against trolleybuses in any way. The proposed fleet reduction is a good thing for Wellington, becuase it makes service cheaper to operate and thus creates the potential for future abundance. Don't measure the plan by its fleet requirement. Measure it by the mobility outcomes that it delivers, including the dramatic expansion of all day frequency. 5. The debate about the trade off between maximizing patronage and maximizing coverage (for social inclusion) was not explicitly had by the community… This policy to maximize patronage is essentially a decree by Government, and GW should be consulting more explicitly about this trade off before just deciding to redesign the network to maximize patronage. I have facilitated exactly this debate many times, and Chapter 10 of Human Transit is all about it. I agree that the debate should ideally be a public one. In this study, the decision was to avoid reducing coverage as much as possible. We retained coverage to virtually all areas now served, though not necessarily on the same streets, and in some cases we expanded it. If we had been charged with shifting priorities massively toward ridership, we'd have proposed deleting a lot of coverage to low density or hard-to-serve areas, including areas like Kowhai Park, Wright's Hill, Houghton Bay, Melrose, Owhiro Bay, Broadmeadows etc. We didn't do that. Related point: radical network redesign has a human cost in terms of elderly, infirm, other marginalized users who may be too confused, disoriented or afraid to use the new network because they will feel lost. This is a major issue in every network design. But this concern, stated so broadly, becomes a reason to never change anything, and to allow the network to retreat into irrelevance by never updating it to reflect the needs of a changing city with growing sustainability goals. The answer to all these needs is a mixture of (a) careful information and travel training, to ensure that information or understanding is not a barrier to the new network, (b) appropriate on-demand services for people who simply cannot use fixed route service, in their location, for reasons of disability, and (c) urgent attention to where facilities are built for seniors, disabled persons, and others at risk of falling into this "marginalized" category. Locate on the network of high-quality freqeuent services (which the plan expands) and you won't need to worry about your service changing often in the future, because the more frequent a service is, the more permanent it is. 6. Some concern about the principle of designing for an all day basic network because the nature of journeys in Wellington is very different during the day for work trips and other kinds of trips off peak etc. While travel patterns change in the course of the day, there is a very important reason to resist changing the pattern of service several times during the day. Such changes result in maddening complexity, and dramatically undermine's people ability to use the system freely and spontaneously. Imagine what driving in Wellington would be like if you had to remember that the basic geography of the city changes completely several times during the day. Suppose that during the day streets changed direction, or became longer or shorter, or closed at certain hours (different for each street), or even that streets connected to each other differently depending on the time. You might justify this based on optmising flows for each moment of demand, but it would drive any motorist (or cyclist, or pedestrian) mad. Buses physically can change their patterns in very microscopic ways, but good urban networks don't do that much because the overriding goal is to be simple and legible. Sustainability outcomes in particular, notably reducing car ownership, require that the transit options be simple and easy to trust. And that means transit lines that are doing the same thing all the time. So instead of changing patterns by time of day, we focus on designing a basic network that makes sense at all times, and then adding supplemental peak-only services when certain flows appear. Even then, we focus on trying to make the all-day network useful for as many trips as possible. Because that's how you build a network that feels, and is, permanent, ready to support the further growth of the city in a more sustainable form. 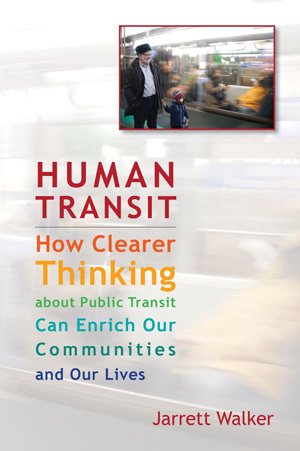 For a more complete discussion of this issue, see Chapter 8 of Human Transit. To sum up, the proposal is designed to aggressively support the growth of Wellington in more sustainable ways, and as such it deserves some Green support. Unfortunately, mobility and access outcomes are hard to illustrate. I wish every citizen had access to an online tool that would show how their personal transit access would change under the proposal. It would something like mapnificent.net for both existing and proposed networks, showing how the proposal expands the area that you can get to quickly, and thus, in a very basic sense, expands your freedom. Only a network that does that will help people sell cars and trust public transport more for all the needs of life. So consider judging the plan on how well it does that. This blog rarely goes on about interesting transit vehicles, since my main interest is in getting people where they're going in whatever vehicle makes sense for the purpose. But while working in Wellington last month, I made early morning ritual of climbing to the Botanic Gardens summit just west of downtown, and on one such walk I took some time to admire the cable car. "Cable car" generally means any vehicle attached to a cable that provides the locomotion. The car has no engine, but an engine of some kind is moving the cable. The cable can be aerial (gondolas, aerial trams) or underground (San Francisco cable cars) or it can just lie on the surface in a special guideway, as in most funiculars. Wellington's is essentially a funicular: it runs in a dead-straight track up the side of a steep hill. The two cars are fixed to the ends of a single cable, connected at the top, so that they move in counterweight fashion, one car rising as the other descends. The spacing of the other stations is limited by the design or the system, because when a car is at the station one up from the bottom, the other is stuck the same distance below the top. In Wellington, even spacing of stations — not always ideal for local geography — ensures that both cars are at stations whenever they stop. But enough with technology fetishes. Why is this thing useful? Easy: it's a straight line, running at high frequency, through high density, where competitors are at a disadvantage. The terminal stations are Lambton Quay in the heart of downtown and the Botanic Gardens summit. There's demand everywhere on this dense hillside. Botanic Gardens station offers a level walk into the fairly dense Kelburn district to the southwest, while Lambton Quay is right on the Golden Mile, where buses come every minute or less to take you north or south through downtown, and beyond. The other stations are Victoria University, one down from the top, Talavera in the middle, and Clifton, one up from the bottom. Victoria University's campus is visible on the south side of the above image. It has its own bus services, but it's a short level walk along a terrace to its station. And while climbing this hill is something I might do as early morning exercise, it's understandable that you might want an alternative to that. The climb is 120m of elevation gain in only 612m of horizontal length, a grade of nearly 20%. But the real reason I thought to write about it is the interesting feature observable at the top. The vehicles themselves are designed for their constant slope. The floor is always parallel to sea level while the car's structure is tilted 20% from the floor, to match the grade. As a result, it's possible to open the car on both sides and produce a level boarding from the surrounding ground. Where the car dwells at the top, as in this image, you can even walk right through the car as though it were part of the sidewalk. I'm always interested in ways to make transit feel more continuous with the pedestrian realm. I long for buses with precise docking for absolute level boarding — not just to eliminate the delay of wheelchair ramps but also to create a feeling that the bus is a moving piece of sidewalk, that you are not leaving the street to crawl into an oppressive enclosure. Local transit won't really feel effortless to use until we have this effect. So that's why this image appealed to me, so much that I even indulged some uncharacteristic technology-fetishism. Because the effect in this picture in important, and if I need a cable car to get it, I'll take a cable car.